I love Pinterest. A lot of the ideas for my wedding came from things I saw on Pinterest. But before I talk about those, I wanted to share some of the various Pinterest projects, large and small, that I’ve done around the home. I came across this blog one day and knew I had to copy it. The steps were fairly easy. My only struggle was that the black letters I wanted from Hobby Lobby, which were 12″ tall & frequently go on sale, for some reason did not include an ampersand. So I bought a plain wooden one from Amazon, painted it black, and Mod Podged it. The frames I got from the clearance section at Michael’s; 20 x 24. This is a very simple, yet elegant in my opinion, way of decorating an entire wall. This project didn’t have a particular pin attached to it exactly, but it looks Pinterest-y to me! I was developing prints for our save the dates, and Walgreens had a great deal. So I began to think of ways to display 4 x 6 photos without framing a bunch of little pictures. I used the same type of frame as I had for the bedroom makeover, cut a piece of cardboard to match the size, and painted it black. I used a glue stick to attach the pictures to the card stock I was using for the save the dates, which was 4.5 x 6.5 so there’s a nice little border. 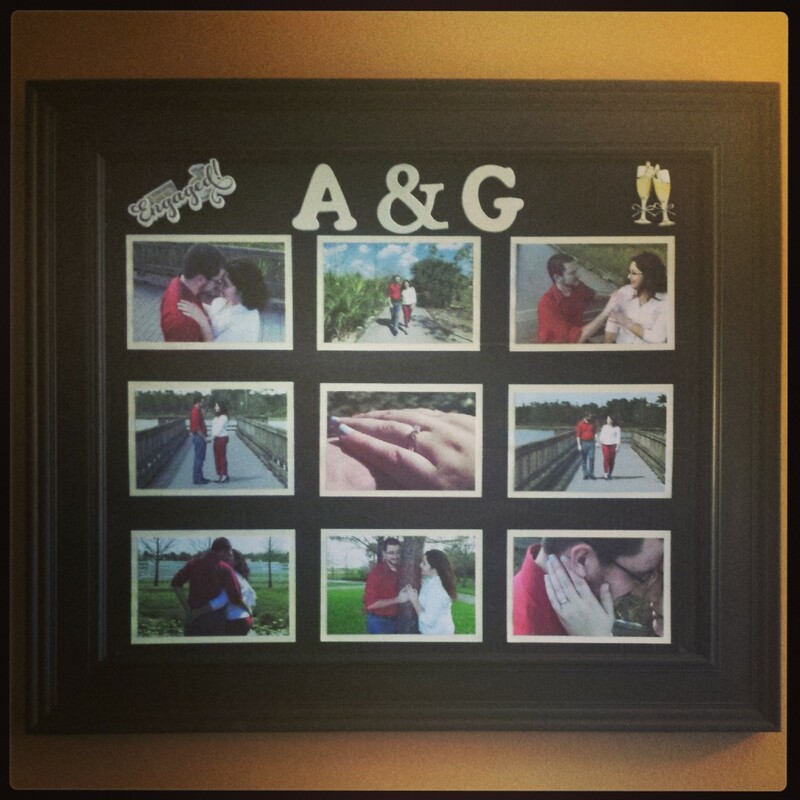 I then mounted the card stock framed pictures to the cardboard with glue sticks & Mod Podged (is that a word? I’m going to keep using it) the whole thing. For the final touches I bought some little wooden letters, and again this time I could not find an ampersand to save my life (Michael’s this time). I ended up buying some sticker letters that were approximately the same size/font which included the elusive ‘&’, and painted both the letters and sticker to match the card stock frames. In the sticker aisle I saw these really cute ‘we’re engaged!’ stickers & there you have it. Once we get our wedding photos back we will replace this in our living room with some of those, but it’s been really nice to be able to look back on that day and smile. My mom took those pictures at a local park. We had such a blast; still on the high from getting engaged the week before. That newly engaged feeling was great. The only thing that has topped it for me is this wonderful newlywed feeling. Every time I say ‘my husband’ I smile. One of the best parts about having nieces & nephews is doing things like this for them! I have always liked having small charms like buttons & sequins, but have done very little with them. Then one day I came across this button elephant & button monogram. Aren’t they adorable? I had to make something like this for my nieces. This involved some patience and a lot of hot glue. I traced my designs on to one of those hard thin canvases, & just starting placing buttons. Then I used the sequins to fill in the gaps. For the L, the zebra buttons are just white ones I drew stripes on. Nothing too fancy! Gluing sequins was a lot of work; the hot glue kind of melts them. I wonder if a different glue might be better for them, but to be honest this was the messy fun type of project that I like sometimes. I recently read one of those life hack things that said putting petroleum jelly around the end of a glue gun helps prevent getting webs of glue everywhere. I have not tried this tip personally, but next time I use my glue gun I will. This Pinterest project was super easy & makes me all happy when I look at it. I feel like I have to admit that I actually made this after New Years right before we took the tree down (I’m one of those Christmas-isn’t-over-until-January-6th people). After Thanksgiving, I told my mother-in-law we were getting a real tree and she reminded me of this Pin she had seen. So when we picked out our tree we asked the guy to cut us a slice from the bottom. I didn’t even drill a hole in it. I just used a screw eye hook (not gonna lie – totally had to look up what the ‘screw with the hole that came with my picture hanging kit’ was called) & manually screwed it in to the tree slice. After I was done writing on it in Sharpie, I sprayed the whole thing with an acrylic sealer. Man, was this a project! We had this very large blank wall at our place. I had been looking at pins like this one & this one. You do the math. The first step for me was actually finding ‘family’ in the three different languages. Originally I had said I wanted something like ‘family, love, faith’, but my husband was the one who came up with the idea of the three languages. I love it; it shows off our melting pot pretty well. So after some searching I found this shop on Amazon. They have lots of cool stuff, and I’m very pleased with the quality. Lightweight, but still really solid. The only thing is that they took FOREVER (2 weeks) to arrive. So if I order from them again I will definitely do expedited shipping, or learn to be more patient. It depends on what my wallet tells me at the time. Along with the words I knew I wanted an ‘M’ & I knew I wanted a cross. The cross is actually a painting I did back in college when I first became a Christian/was saved/met Jesus/insert-Christian-jargon-here. 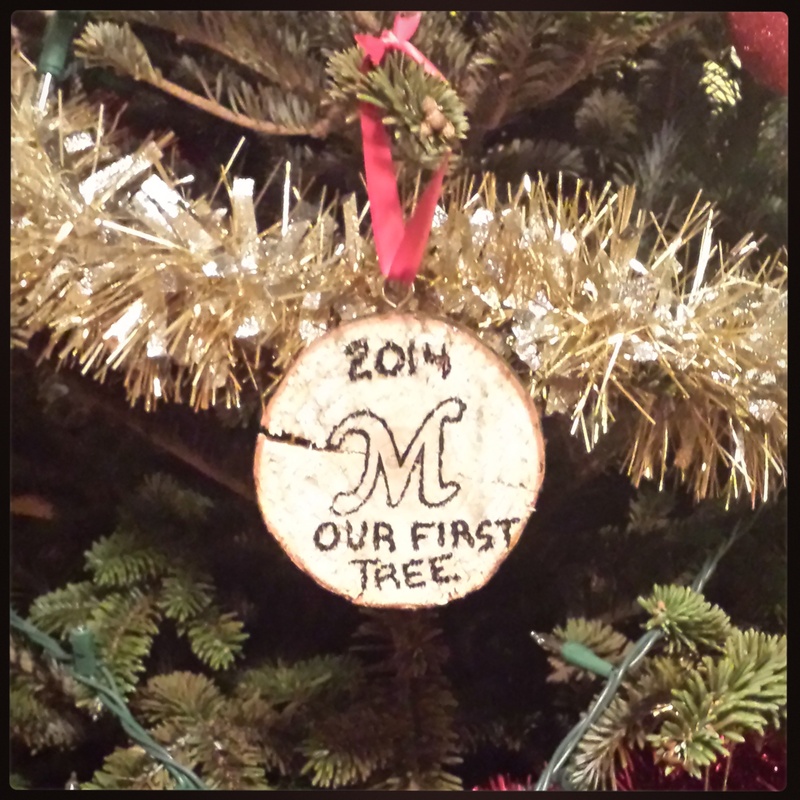 The ‘M’ is from Hobby Lobby; same as the letters from the bedroom makeover. The rest just fell in to place. We had bought the mask in Venice intending to do something with it, and it fit in just right. The big picture in the center of the collage was actually taken by us in Burano, which I highly recommend seeing to anyone visiting Italy. I cannot wait to someday go back. Anyway, getting back to the topic at hand, next was the frames. I had several 8 x 10 & 11 x 14 because I usually buy frames if I see them on sale or clearance. Then I went to the dollar store & just picked up a bunch of 5 x 7 & 4 x 6 frames. This picture doesn’t do them justice, but it’s actually a bunch of different styles of frames. So with the frames all picked out, I started designing the layout. Basically I gathered all of the frames, sprawled myself out on the floor with them, and started arranging. I’m kind of type A/ kind of OCD about certain things like lines and shapes, so I made this more like a rectangle and less like a free-form collage. Of course I couldn’t actually leave all of this stuff on the floor, so I used measuring tape to record the dimensions & took lots of pictures of the set up. I actually didn’t pick out what pictures I wanted to include on the wall until after I had done the layout. That made it a lot easier to be like ‘OK I need this many 8 x 10 landscape, this many 5 x 7 portrait,’ etc. Once I got all of the pictures I wanted developed, the only thing left was to hang everything up! One day after work I just grabbed the hammer and started going at it. 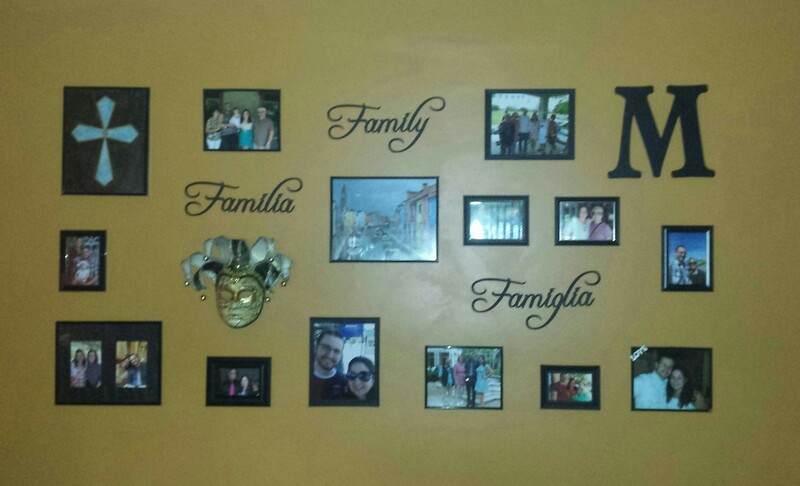 I put up the ‘Family’ word first, then the cross painting & the M. Then I put the Burano picture up in the center, followed by the 2 bottom corners. After that it was just a matter of trying to follow the measurements I had done on the floor earlier, and making sure it looked nicely spaced on the wall. So, the whole process from conception to execution was probably about a month. I love this wall. This is my favorite thing about where we live right now & when we move I will be replicating this idea in some way. So there you have some of my older Pinterst projects. What are some of yours? ← We all scream for homemade ice cream!